Fairbanks Morse has launched a new version of its two-stroke opposed-piston engine, with its sights set on the distributed generation and CHP markets. The new engine, the Trident OPTM, rated at 3.335 MWe (900 rpm, 60 Hz version)/3.705 MWe (1000 rpm, 50 Hz version) boasts a mechanical efficiency of 48-50% and is described as “best in class when compared to leading medium speed engines.” It has twelve cylinders, each containing two opposed pistons. Two-stroke opposed-piston engines have inherent efficiency advantages stemming from the absence of cylinder heads, which means the combustion chamber has a lower surface-area-to-volume ratio than a conventional engine, and the fewer strokes per cycle compared with a four-stroke engine. There are also less moving parts and a reduced overall part count compared with a four stroke engine with its four valves per cylinder. Optimised heat transfer losses, leaner combustion, advanced timing and reduced pumping power have further contributed to increased efficiency. 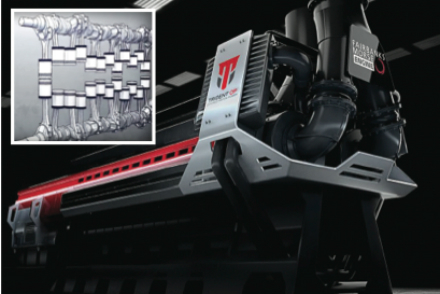 “The cost savings from fuel efficiency and increased reliability from 30 percent fewer moving parts equate to a lower total lifecycle cost when comparing Trident OP against other high or medium speed engines for prime power applications,” says Fairbanks Morse (a division of EnPro Industries). The new engine “leverages Fairbanks Morse’s 85 years of experience designing and manufacturing the only medium-speed, opposed-piston engines available in the world,” says Marvin Riley, Fairbanks Morse president. A further advantage of the opposed piston configuration is that counter-rotating crankshafts (one above the cylinders and one below) and counter-reciprocating piston assemblies inherently balance the engine, resulting in lower vibrations and greater reliability, contributing to increased time between overhauls. Provision of selective catalytic reduction helps the 60 Hz model of the engine achieve an EPA Tier 4F emissions rating. In the case of a 10 MW Trident OP based power plant, for example, Fairbanks Morse projects that the new platform will achieve $35 million in lifetime savings from reduced fuel consumption and increased reliability. Fairbanks Morse notes that currently some 1.2 billion people lack access to power and another billion only have access to intermittent power. Emerging economies are expected to see around 41% growth in energy demand by 2040. On the other hand, in the USA, energy demand is flat, an aging grid and an apparent increase in superstorm frequency are also engendering power reliability concerns, with nine of the 12 most expensive storms in US history having happened within the last three years. In both situations, says Fairbanks Morse, “decentralised generation, independent power production, and microgrids are seen as the enablers needed to drive reliable power in the new energy economy.” As a result, Navigant Research estimates that annual distributed generation capacity additions will outpace centralised generation three-fold by 2024. The PoweReliability-as-a-Service platform is enabled by cloud- based bi-directional data flow and control so that power generation can be monitored in real time to deliver on specified fuel and reliability guarantees. As an open platform, it can be customised to include the integration of distributed energy resources (DER) such as renewables, combined heat and power and energy storage. Fairbanks Morse believes its PoweReliability-as-a-Service platform will enable independent power producers and commercial & industrial end users to integrate the distributed energy resources of their choosing to operate fully as an independent microgrid or, where available, participate in ancillary services markets such as demand response. Meanwhile, another developer of opposed piston technology, Achates Power (which has had a joint development and licensing agreement with Fairbanks Morse since 2013, and has contributed to development of the Trident OP), has received funding from OGCI Climate Investments. This is the billion dollar investment arm of the Oil and Gas Climate Initiative (OGCI), a CEO-led initiative of ten major oil and gas companies aiming “to lead the industry response to climate change.” OGCI Climate Investments was established in November 2016 and the Achates opposed piston engine is one of the first technologies to receive its backing.